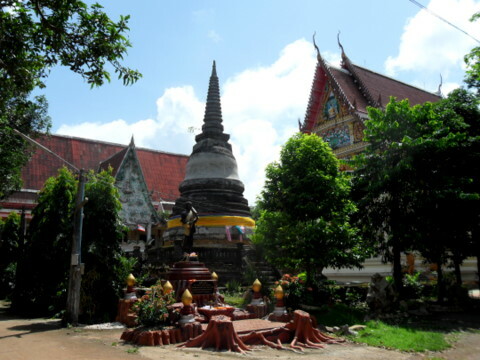 Chanthaburi (chan - moon, buri - city) is a province on the Eastern seaboard of Thailand about 260 km from Bangkok. 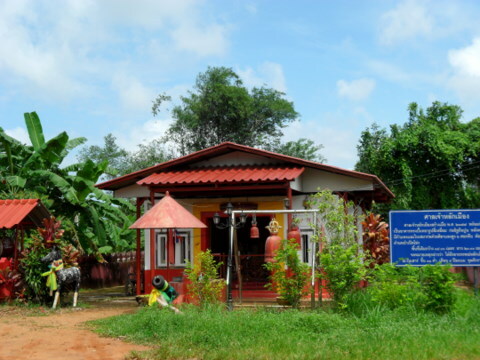 It shares its eastern border with Cambodia like Trat province to the southeast. The provincial capital is famous for its gem trade, a result of a thriving gem mining industry in the past. The gems have since been depleted. However, the gem centre in the city is still there and has more gem traders than food vendors. 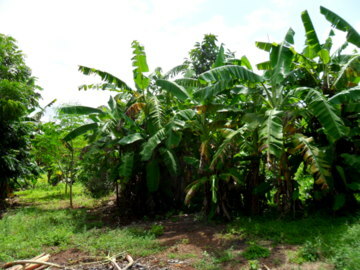 Fruits like the favourite durian are also grown in Chanthaburi. 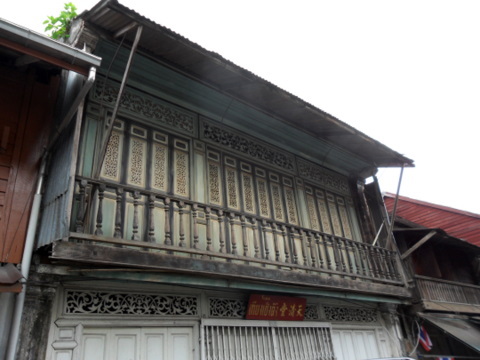 But I visited Chanthaburi to look for other treasures, old historical gems. 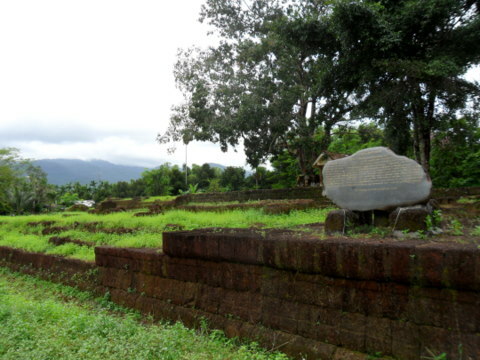 Just outside Chanthaburi city lie the ruins of a very old city that’s almost 1,500 years old. 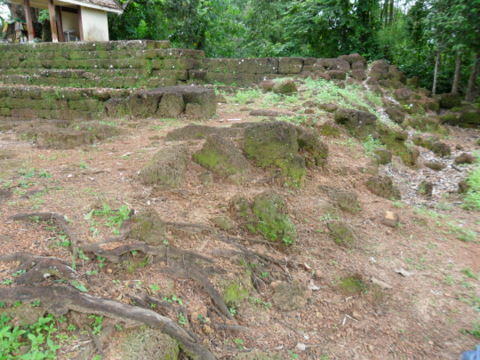 Very little remains of the ruins and they are not as well-known as some of the other old ruins in Thailand even though these ruins in Chanthaburi are just as old. 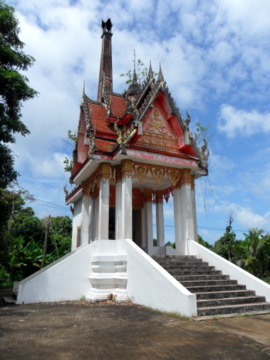 Chanthaburi was also the place where several significant events in Thai history took place. Just before Ayutthaya fell on 7 April 1767, Phraya Taksin broke out of the siege ring with a group of men and rode to Chanthaburi. Here he was able to get the support of the local Chinese villagers to build his army and navy. 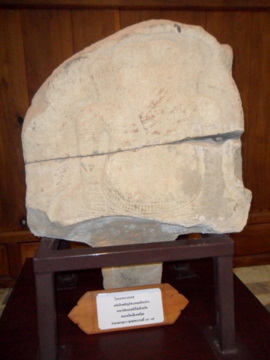 From Chanthaburi, Phraya Taksin set up his new capital in Thonburi as King Taksin and drove the Burmese out of the kingdom. 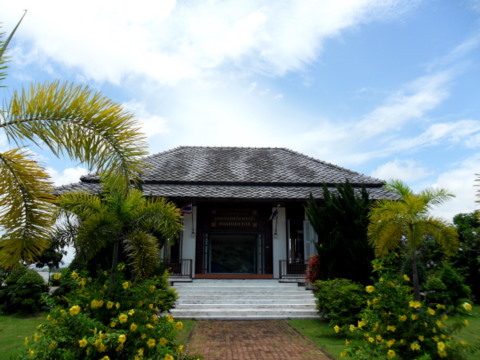 Chanthaburi remembers her place in Thai history and there are several monuments preserved in honour of King Taksin. The entry of Vietnamese refugees to eastern Thailand in the 1700s has left a cultural heritage and diversity that remains till today. 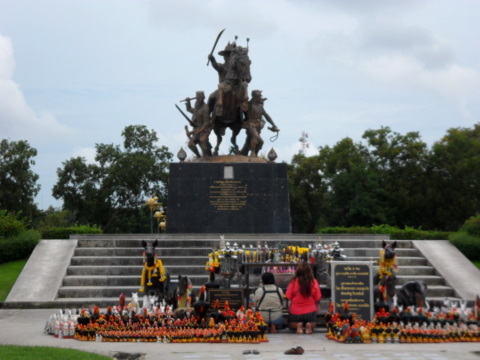 In the reign of King Rama III (1824 – 1851) the war with Vietnam over control of the Cambodian kingdom made Chanthaburi the frontline for the conflict. 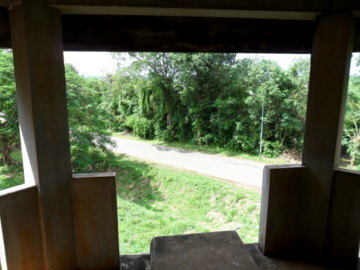 The ruins of two forts from this period are still in Chanthaburi. This place wasn’t in my itinerary. It was my last day and I was returning to the city after I’ve completed my tour. Ag the motor-cycle taxi rider who took me around the last two days suggested we go to Wat Thong Tua for something very old. As I had the time, I agreed. I am glad I did. Wat Thong Tua is about 6 – 7 km outside the city. Like any provincial temple, it has a school collocated with and named after it. Long before government and missionary schools were built, temples were the centres of learning. The boys were playing football in the court during their lunch break. It wasn’t the main temple that held the attractions but a separate building. The caretaker led me through the dark hall to an adjoining building to the rear. The first exhibit I saw took me by surprise. 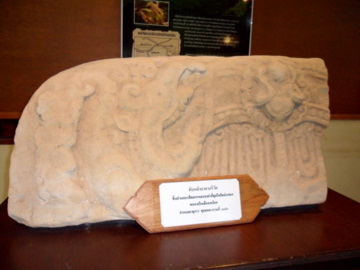 It was a sandstone lintel that represents the oldest form of Khmer architecture dated BE 1150 or 607 AD! There were several other pieces on display with ages ranging over the six centuries. There is part of an unfinished statue of Ganesha the Elephant God indicating the Hindu influence on the city. 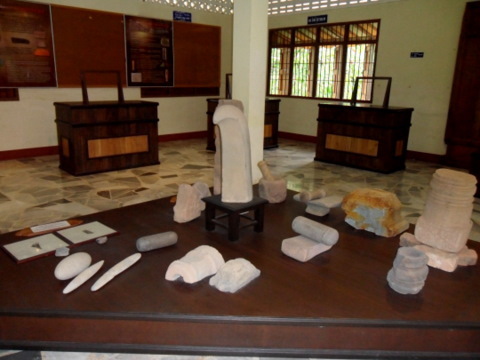 Some of these pieces were pillars, pedestal or parts of pedestals for religious relics. 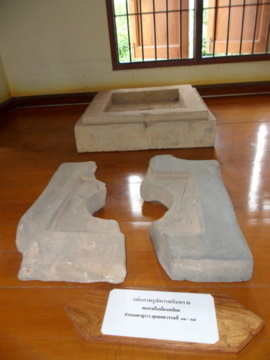 All these artifacts were discovered from an ancient site about 300 m from Wat Thong Tua. 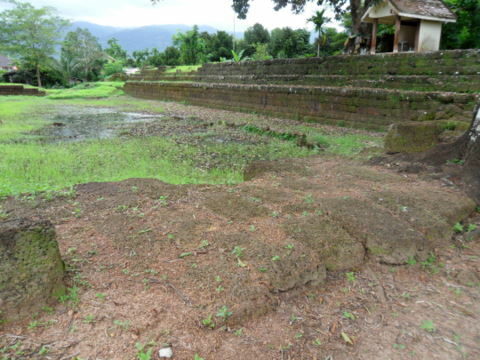 These ancient ruins are all that’s left of a prosperous city Mueang Phaniat, probably a Khmer sanctuary that existed in 7th C AD. The ancient city was destroyed centuries ago and over the years these old stones were lost. 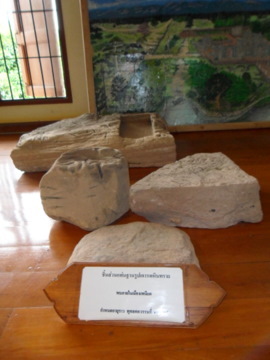 Mueang Phaniat is the earliest form of civilization in Chanthaburi. 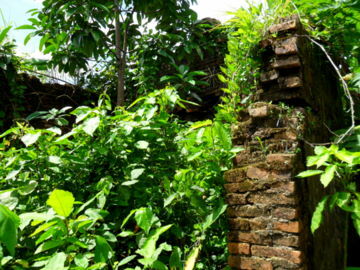 The ruins of Mueang Phaniat consist of a wall area 16 m by 26 m and a metre high. 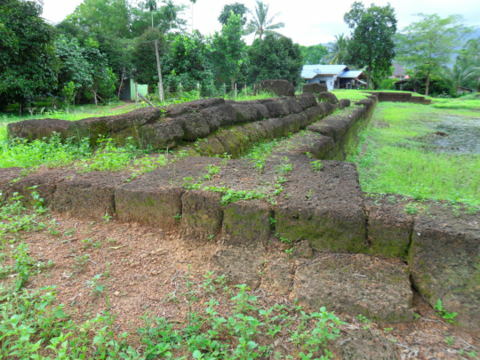 The walls were made of laterite 3 m thick and filled with earth for reinforcement. On 8 March 1935 it was registered by the Department of Fine Arts as a national heritage. 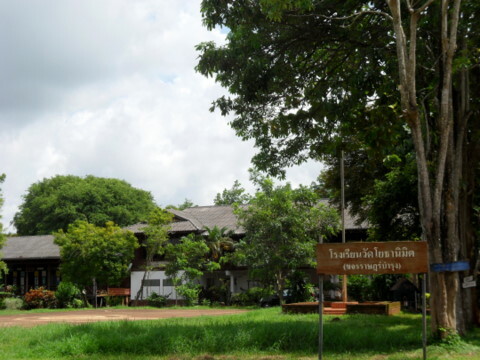 Today Mueang Phaniat is preserved as cultural heritage of Chanthaburi. King Taksin the Great is well remembered in Chanthaburi. There are many places named after him including a school, an army camp and a road. 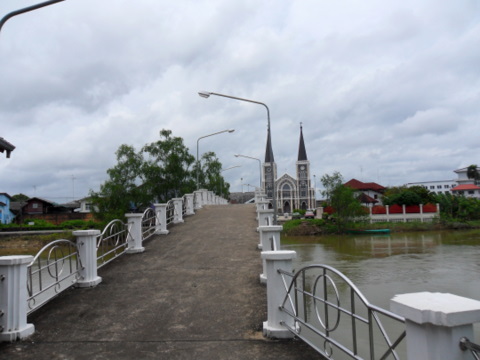 Here are some of the prominent landmarks in his memory in Chanthaburi city and beyond. 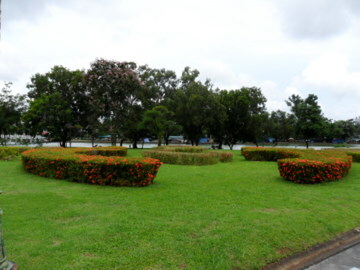 This 20 hectare public park named after King Taksin is in Chanthaburi city. 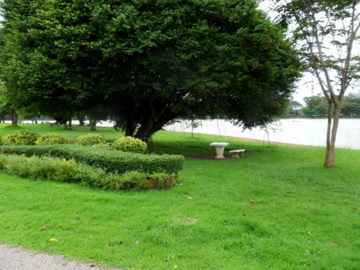 The park consists of an island with beautiful gardens in the middle of a huge lake. Though it was a Sunday only a few people were spending their afternoon there. 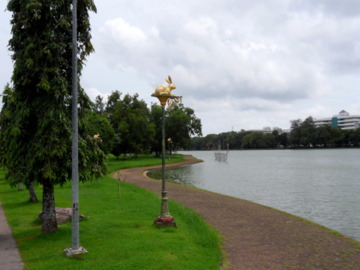 Visitors to Chanthaburi can’t help but notice the symbolic rabbit on top of lamp posts and road signs. It’s believed to be the image you will see when you gaze up at the moon. The centrepiece of the park is this majestic monument of King Taksin mounted on his battle charger with his loyal troops rallying around him. Judging from the flowers and garlands at the foot of the monument, many people pray here. 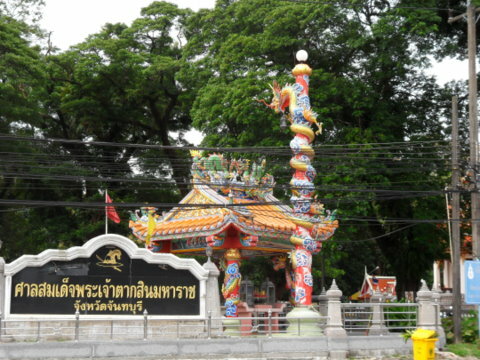 As you travel along Thaluang Road in Chanthaburi city, you will pass a structure shaped like an 18th C battle helmet. 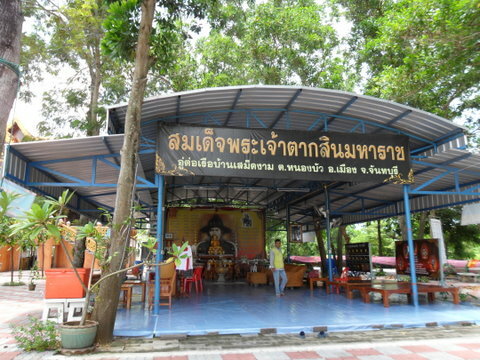 This is the King Taksin Shrine which is located next to the City Pillar Shrine. At the corner stands a Chinese shrine with a dragon coiled round a pole evidence of the ethnic Chinese population in the city. The Taksin Army camp is just behind the shrine. The King Taksin Shipyard was where King Taksin built his fledgling navy to transport troops back to the Chao Phraya basin to drive the Burmese out after the fall of Ayutthaya. 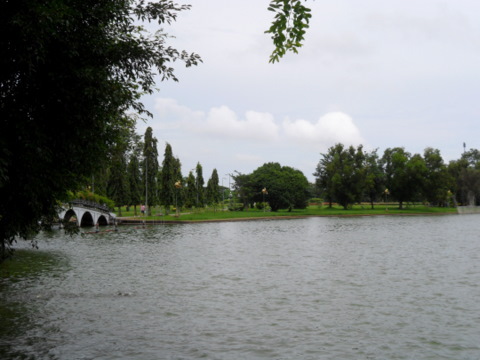 It’s located about 15 km from the city centre in one of the many tributaries of the Chanthaburi River. The yard is about 7 km from the coast in sheltered waters and hidden from direct observation from the sea. 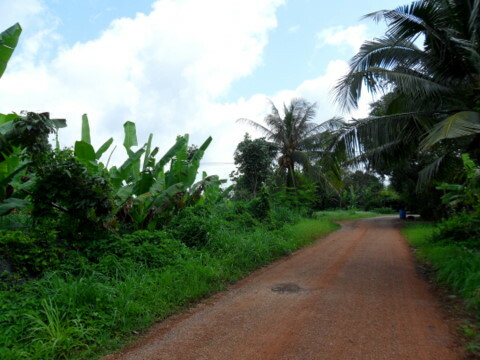 From Highway 3146, the main road from the city, we had to go through about 11 km of narrow country lanes to get to the yard by the river bank. 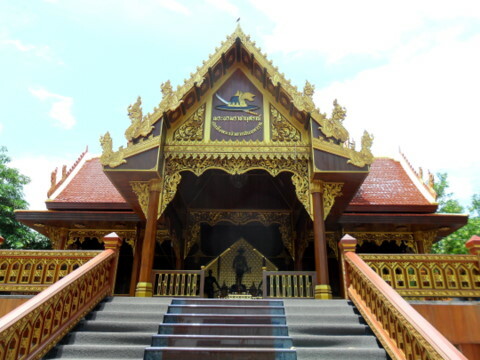 The place has two shrines dedicated to King Taksin, one in an open shed and another housed in elaborate building. Ag the motor-cyclist who took me there said that he had visited this place many years ago and made it a point to pray at both shrines. The old boat exhibits however were just left in a shed. Some of the boats are already deteriorating. It’s such a pity that such historical relics are not preserved well. 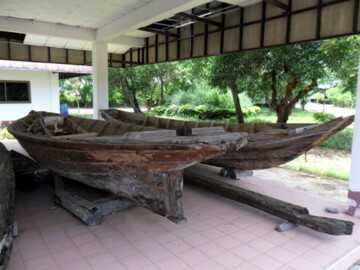 Within the grounds of this former shipyard is a museum dedicated to King Taksin depicting his battles, shipbuilding in the old days and some very old pottery. 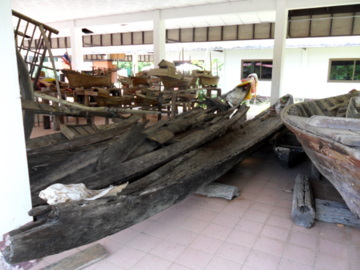 During the 15th – 18th C, some Chinese and Vietnam trading junks carrying Thai pottery were shipwrecked off the coasts of Rayong and Chanthaburi. 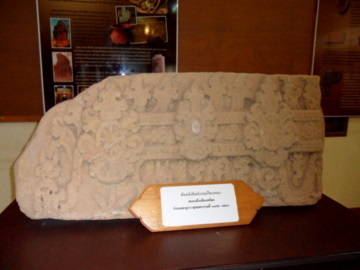 When the cargo was recovered in 1976, they turned out to be rare 13th – 14th C Sukhothai pottery. I believe these are some of the pieces on display here. 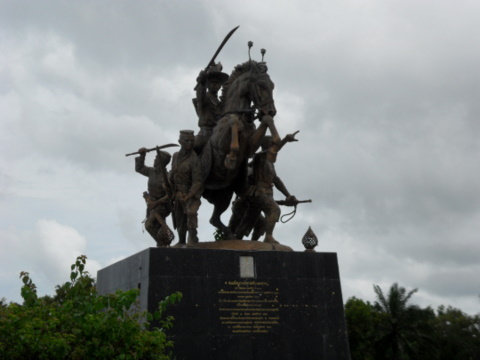 During his reign in Thonburi (1767 – 1782), King Taksin military campaigns drove out the invaders, united the fractious kingdom, extended and secured her boundaries, a condition never achieved before. That could account for the deep respect accorded to his memory in places I have visited in Chanthaburi and Rayong. 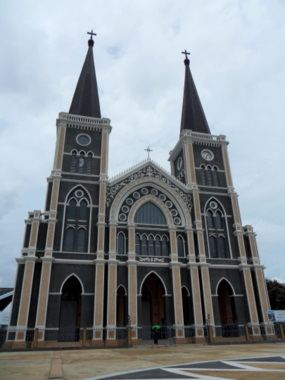 I read about this famous cathedral in Chanthaburi years before I lived in Thailand. When I visited the city again, I caught sight of the twin steeples above the roof tops. The Cathedral of the Immaculate Conception is a beautiful and impressive structure. As the cathedral appeared to be quite close to my hotel, I took a walk there. It took me a while to wind through these narrow lanes past some old and quaint houses, asking directions along the way before I got there. 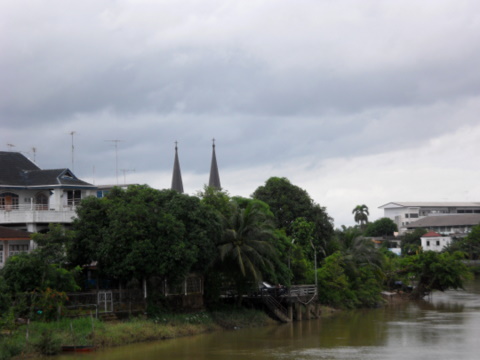 In early 1700s Vietnamese Catholics fleeing from religious persecution came to Chanthaburi. As a result a church was built. Since then it has been rebuilt four more times. The current building was built in 1909. 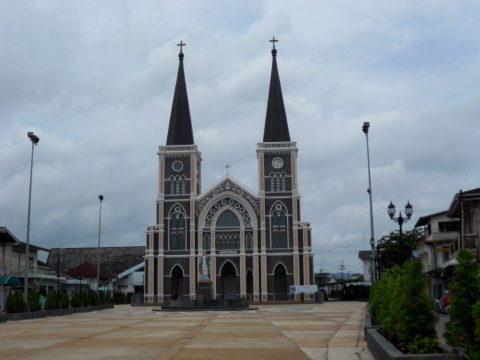 It’s the largest Catholic church in Thailand and Chanthaburi has the largest number of Catholics in the country. The church acquired the status of a cathedral in 2002. In the reign of King Rama III (1824 – 1851), Chanthaburi became the frontline for a war between Thailand and Vietnam over Cambodia, a buffer between the two countries. Both countries tried to prop up their protégés in the power struggle within the Cambodian royal house. 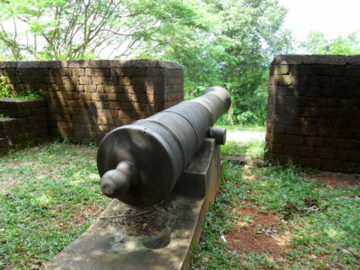 With this war, forts were built in Chanthaburi. 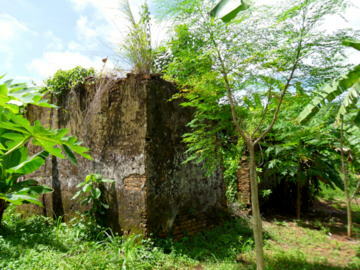 The ruins of two forts are still present in the province. We will cover the ruins that are just outside the city. The other fort is in another part of the province and will be covered in the next issue. Khai Noen Wong or Noen Wong Fortress was built in 1834 about 8 km outside the city to defend Chanthaburi against a Vietnamese invasion. It’s located at the junction of Highway 3146 and3147. 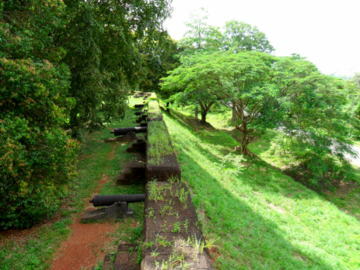 The walls and front entrance to the fortress are still in good condition with 39 old cannon on the ramparts. 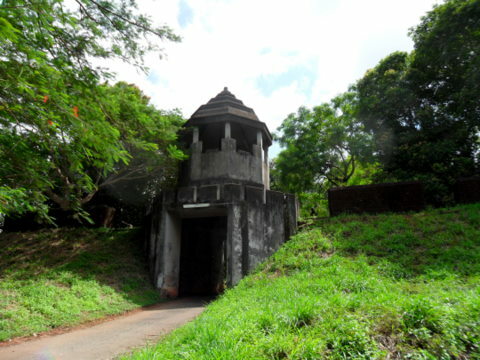 The fortress covers an area of 270 rai or 43 hectares. I had expected to see just the ruins of an old fortress and was surprised, after viewing a map of the area, to discover these places within the fortress walls. 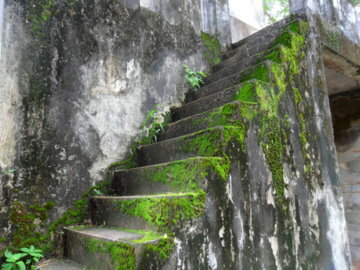 I climbed up the moss-covered steps to have a closer at the cannon on the ramparts. There is a metal ladder from the ramparts going up to the watch tower. The ladder’s a bit rusted so I wouldn’t recommend that you try to go up to the watch tower. The museum beyond the main entrance unfortunately was closed. It was a Monday. It’s closed on Mondays and Tuesdays and open from Wednesday – Sunday from 9 am – 4 pm. So I decided to explore the rest of the grounds. It’s a huge area and I regretted not keeping the motorcycle with me. 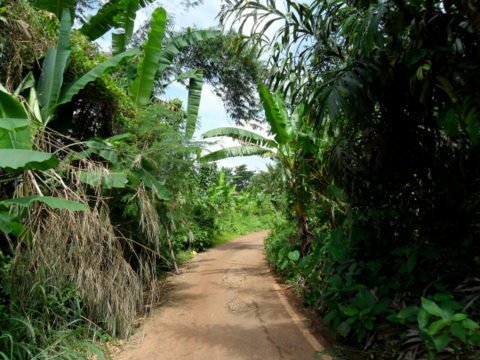 These are the places I managed to cover on foot through narrow country lanes. There were some houses along the way, before I reached the temple and school. A crematorium is located in one corner. I stopped to ask for directions. The 80-year-old gentleman who was enjoying his morning cigar on his veranda was kind enough to help me and he also had an interesting story about the place. "Lung" (uncle) told me that the original community consisted of the fortress garrison with their families. They have moved out since. Other military families moved in. "Lung" served in the Royal Thai Navy at Sattahip before. 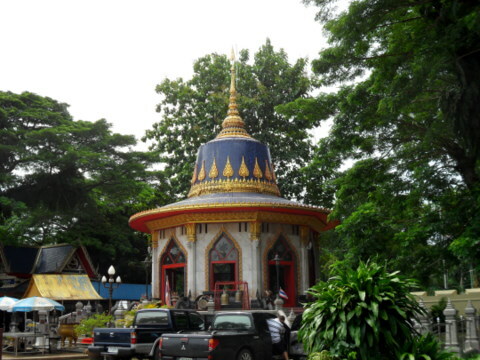 He is now the caretaker of the King Taksin Shrine which is collocated with the Foundation Pillar Shrine. His grandfather and father were also in military service. His son is currently with the Navy in Sattahip. After this interesting conversation, I moved on to try and find the old magazine where they used to store the ammunition. I would never have found it without the help of a young man living nearby. It’s just behind his home! It was completely obscured by the trees and undergrowth and you can’t see it from the track. After this, it was a long walk back to the main entrance to wait for the motorcycle back to town. It was a very interesting visit to Khai Noen Wong. 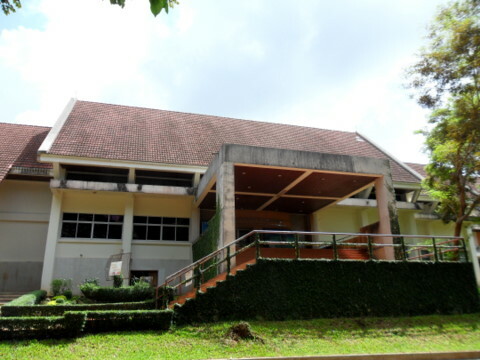 Though a historical relic, it has a museum and a community living within the walls. You are not just visiting a lifeless old fortress. Switch to satellite or Google Earth version on the map to get a 3D view of the places. You can take a van from the Victory Monument to Chanthaburi. The Chanathaburi van station is near the junction of Soi Ratchawithi 10 where the Fashion Mall is located. The fare one way is 200 baht. The van will go all the way to the Chanathaburi city centre and terminate at the van station behind KP Grand Hotel. Depending on which part of the city, this is the suggested order of visiting the places mentioned. I stayed at KP Grand Hotel so I visited the Cathedral of Immaculate Conception, then the King Taksin Park followed by the King Taksin Shrine. All these places are within the city centre. Khai Noen Wong is south-west of the city along Route 3146. On your way back visit the King Taksin Shipyard which is to the south. If you are alone, a motor-cycle taxi will do fine. There are also song taeow (pick-ups) for hire. Agree on the fare before boarding. Stay updated with what’s new at Tour Bangkok Legacies. Copy the link below and paste it into your Google Reader, NetNewsWire or your favorite feed reader. If you use My Yahoo! or My MSN, head over to my home page and click on the button for your favourite Web-based feed reader.